I have been watching this when season 1 released. before its voiced by japan voice actors. i'm start from watching the anime. after it's complete season 1. i'm start reading the manhwa. even it's still raw. I still can understand little the language. Then, finally it's annouced there's season 2!!!! I'm so happy to hear that!!! I'm hope there's season 3 !!!!! SHIP KEIKA AND TANMOKU !! I'm pretty recommend this anime! you may read the manhwa first or watching the anime first!!!!!!!!!!!!!!!!!!!!!!!!!!!!!!!!!!!!!!!!!!!!!!!!!!!!!!!!!!!!!!!!!!!!!!!!! Finally, a shounen-ai anime with an actual plot. I dropped this anime after watching the first episode of season 1 (which was pretty bad), and ended up taking it up again out of boredom. While the first season did get better and was pretty good in the end, season 2 really exceeded my expectations. If you like drama, supernatural, and bl, chances are you'll enjoy this show. The characters are multidimensional (although they do follow some tropes to an extent), and the relationships they have with each other are complex and woven into the story very well. Although the plot does slow down at times, the show uses that time to focus on character development, depth, and backstory. This is not an anime that will leave you hanging due to lazy writing; it follows through, and with good pacing. The music is pretty amazing as well, and gives the story that much more feeling. 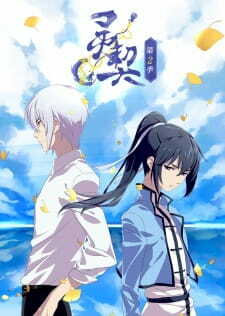 This is definitely a shounen-ai worth watching. There's a bit improvement from the first season plot. I can see the goal in the second season. It's not face paced unlike the first season, which is good. Plus point for that. It's a solid plot but is it extraordinary, definitely not. I especially do not like the few last episodes because I feel like it drags the story. I still have problems with the characters. I couldn't love the characters back in season one and I still couldn't love them till now. If I still have to choose a significant character in this anime, for season one I would choose Ki in a heartbeat but for season two, it will definitely go to Jiun, the minor character. You Keika- still the same as ever though a bit stronger than the previous season. Ki- Definitely the problematic character in this season. First of all, his character in the past is definitely out of character. If I correctly recall, when we dived into Ki's fiance's past in the first season, we could definitely see a cold Ki when he was a child. However, in this season, suddenly Ki is portrayed as someone extremely kind and carefree back when he was still a child. Somehow I felt uncomfortable watching how his character is drastically changed. Not a fan of that so a huge minus point for Ki. Plus, he is supposed to be the most powerful Youmenshi in the world but in season 2, he seems weak. And please, can someone count how many times Ki coughs out blood for me throughout the episodes? Shouken- He gives me the same vibe as Suzaku from Hangyaku no Lelouch and I don't like this either. Comments: There's definitely something wrong with the tomanku family. It's clearly wrong for what they did to Shouken. Binding his soul and used him as a blood bank for Ki are definitely inhumane acts yet this family did not pay the price for their wrong doings which bothers me a lot. This anime has a solid plot, a good foundation yet missing the important pieces which halts it from being one of the best anime. The fighting scenes aren't that great, the mystery is predictable, the struggles Ki and Keika have to go through is too long which makes the audience (me) bored halfway throughout the story. And please, Shouken, for the love of God and for the sake's of Keika and Ki's happiness, please do not return to the world. this is the 1st time i watched shounen ai anime nor i interested in this genre. so i'll try to give my honest point here. This is about love from the present & the past. The backstory is too long to be told (took 4-6ep or maybe the whole season). it depends on what you like. if you're originally is a shoujo person, you probably not enjoy much (considering love triangle until the end). but if you like drama, this is for you. the main character (tanmoku ki) also become so weak different from the 1st season. the plot is lagging. too long for a backstory of tanmoku ki. the other main character (keika) become lesser. basically, this season is about the past love of tanmoku ki & shouken. also, there is the episode that keeps rewinding the same scenes.